Showing results for tags 'ventricular septal defect'. Ventricular Septal Defect or VSD is a hole in the wall separating the two lower chambers of the heart. Ventricular Septal Defect is a common heart defect that's present at birth (congenital). In normal development, the wall between the chambers closes before the fetus is born, so that by birth, oxygen-rich blood is kept from mixing with the oxygen-poor blood. When the hole does not close, it may cause higher pressure in the heart or reduced oxygen to the body. A small ventricular septal defect may cause no problems, and many small VSDs close on their own. Larger VSDs need surgical repair early in life to prevent complications. These STL files are derived from a Magnetic Resonance Imaging (MRI) of a 3 year old girl with complex perimembranous to muscular VSD with band dividing it into a large anterior component and smaller posterior component. There are 3 separate files as well as an STL file for 3D printing the whole model at once. The three STL files have been zipped and available for download. Alternatively, one STL file representing the whole model is also available for download. The three part model has holes for magnets, which can be used to connect and separate the pieces. The model is provided for distribution on Embodi3D with the permission of the author, pediatric cardiologist Dr. Matthew Bramlet, MD, and is part of the Congenital Heart Defects library. We thank Dr. Bramlet and all others who are working to help children with congenital heart problems lead normal and happy lives. It is distributed by Dr. Bramlet under the Creative Commons license Attribution-NonCommercial-NoDerivs. Please respect the terms of the licensing agreement. A US quarter is shown for scale in the images below. Pulmonary atresia is a form of congenital heart disease, in which the pulmonary valve does not form properly. The pulmonary valve is located on the right side of the heart and regulates blood flow to the lungs. This defect prevents blood from flowing into the lungs to gather oxygen. Pulmonary atresia is often associated with patent ductus arteriosus and can occur with or without a ventricular septal defect. Symptoms, which usually occur within the first few hours of life, include cyanosis, fast breathing, fatigue, poor eating habits, and shortness of breath. 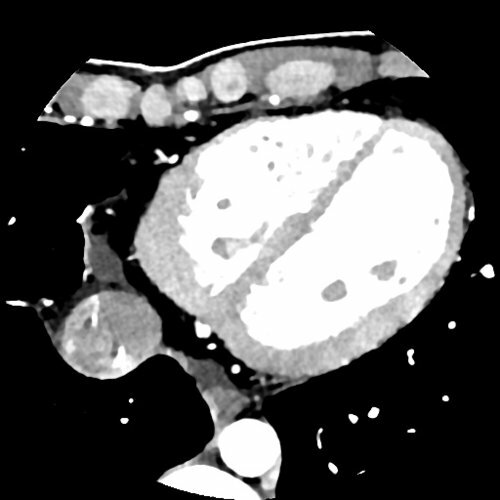 The CT scan, from which the STL files are derived, is from a 3 week old infant suffering from pulmonary atresia, ventricular septal defect with confluent branch pulmonary arteries and patent ductus arteriosus (PDA). In addition, there is a right aortic arch with a tortuous PDA inserting into the right pulmonary artery as well as an atrial septal defect (ASD). The left subclavian artery originates first off the aorta with a common origin of the left and right carotid arteries followed by the right subclavian artery. Five STL files have been zipped and available for download. One blood pool model for extracardiac structural analysis, and four files for the myocardial segmentation. 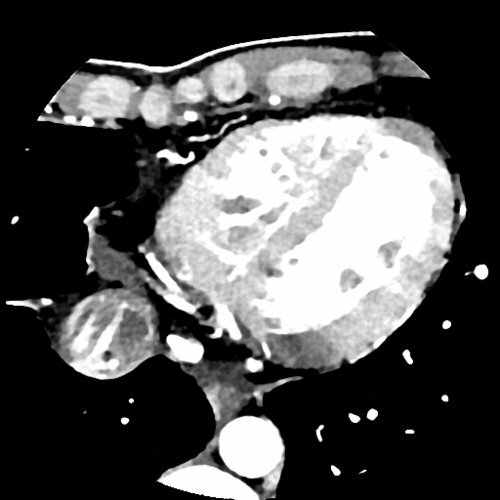 One file of the entire heart and then three files, (1,2 and 3) of the three slice method with the center slice aligning with a short axis slice and containing all valves. The heart model was designed to be printed in three slices and held together with magnets. 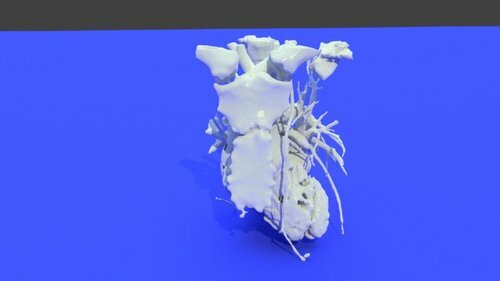 The model is provided for distribution on Embodi3D with the permission of the author, pediatric cardiologist Dr. Matthew Bramlet, MD, and is part of the Heart Library. We thank Dr. Bramlet and all others who are working to help children with congenital heart problems lead normal and happy lives. It is distributed by Dr. Bramlet under the Creative Commons license Attribution-NonCommercial-NoDerivs. Please respect the terms of the licensing agreement. A US quarter is shown for scale in the images below.